I went with blueberry because that’s what I had on hand, but of course this would work beautifully with raspberries, strawberries, cherries… mmm… possibilities! This recipe is extremely forgiving… nothing complicated about it, and best of all it’s fast. You can go from dessert hankering to blueberry cake bliss in just 15 minutes. These are also perfect to take for snacks on the go or mid-day munchies. Once you’ve processed the batter, make sure you roll it into balls straight away, otherwise if it sits around for too long, the coconut in the recipe (which is extremely absorbent) will cause it to dry out. If you find your batter is dry just add a touch more milk to bring it back to the right consistency before rolling. I loved these bliss balls chilled so I keep them stored in the fridge. Though you can always get to munching on them straight away too… Enjoy! 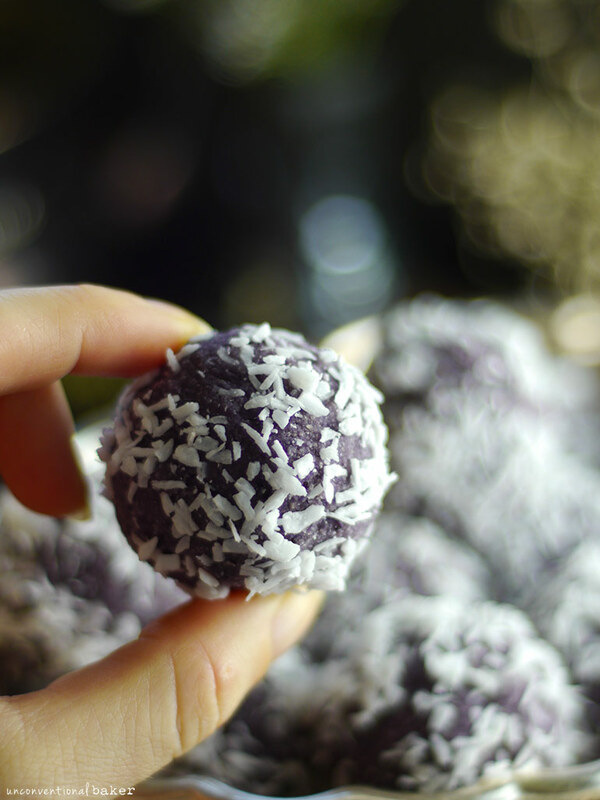 An easy nut-free bliss balls recipe packed with coconut and blueberry jam. Perfect energy bite snack that’s naturally gluten-free and vegan. Process all ingredients, except shredded coconut, in a food processor into a uniform mixture. Allow it to sit for a minute. Meanwhile spread the shredded coconut on a plate. 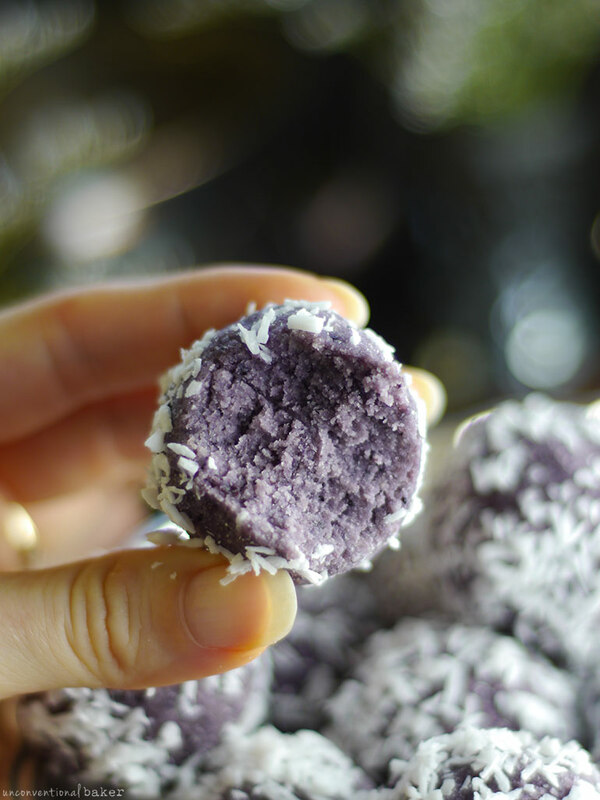 Disclaimer: this recipe contains affiliate links to the shredded coconut, coconut flour, St. Dalfour jam , 1 tbsp cookie scoop, maple syrup, salt, and food processor used to make these. Hi its me again, Dana. I took them to a party and found that several hours later I went back to eat one of the last ones left and it was even better. I would let them sit out at room temperature for a while before serving next time, tasted as good as when 1st made, the little bit dryness from eating them just after being made was no longer there in the bite. 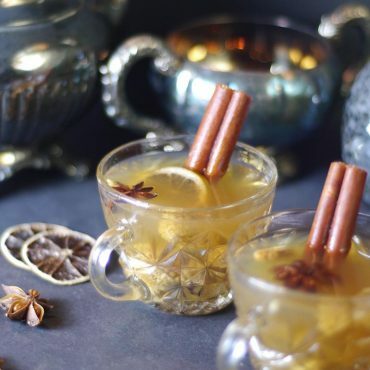 Wonderful nibbles that only take a few minutes to make, before heading out to a party. I didn’t want to go empty-handed. Gosh and it only took a short time to make, I was off with something almost anyone can digest well, especially me. Thank you Audrey. Your recipes are a Blessing! Hi Laura. Sorry the recipe didn’t work out for you, but thanks for your feedback. Just curious, did you let the batter sit a little before rolling? Because during that resting period is when it becomes a bit drier so it’s easier to roll into a ball and they shouldn’t get any drier past this point. It’s also possible they were on the moist side for rolling if the jam used was on the runny side (in which case it would take them a bit longer to absorb the moisture. Would this be adaptable to variations? Hi Laura, I suppose it depends on what kind of variations you have in mind :) It’s easily adaptable to other jam flavors. I love these in raspberry and blackberry flavor, for instance. 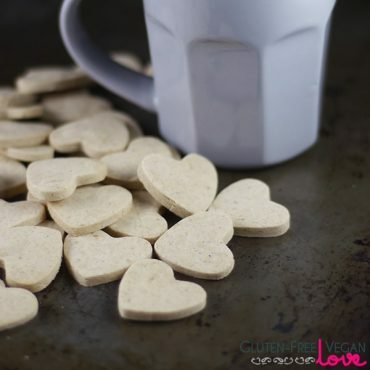 What do you think about substituting almond flour for coconut flour? Hi Katleen, the coconut flour is used here because it’s super absorbent (it’s a unique property to coconut flour). Almond flour isn’t in comparison, so it just wouldn’t work. 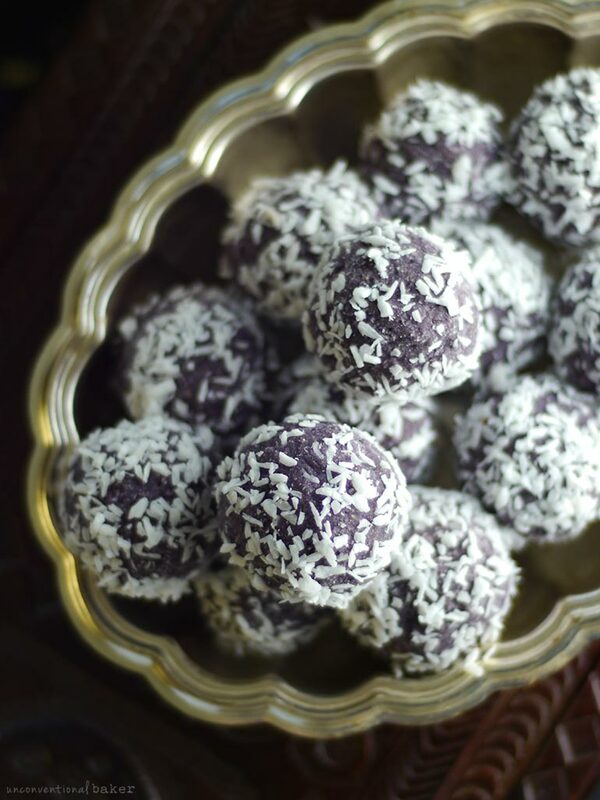 I do have other types of energy bites and dessert balls on my blog though that might work better: https://www.unconventionalbaker.com/all-recipes/ (you can just select “candy & fudge* and “coconut-free” in the categories to get results closer to what you’re looking for). There’s also a delicious recipe for almond bliss balls in my book Unconventional Treats if you’re interested : https://www.unconventionalbaker.com/unconventional-treats-book-videos-options-hp/ (the “cherry almond bites”). Love these!!! Have made them three times now – blueberry, strawberry, and raspberry. All were delicious! The first night we ate them chilled from the fridge. We froze the leftovers and from then on ate them right out of the freezer. Perfection! Next…cherry! Thanks for a great recipe! Thanks for sharing your take on these, Catherine. Ginger + blueberries sounds lovely :) I’m so glad you enjoyed the recipe. Delicious!!! Very easy and fast. I LOVE this idea! 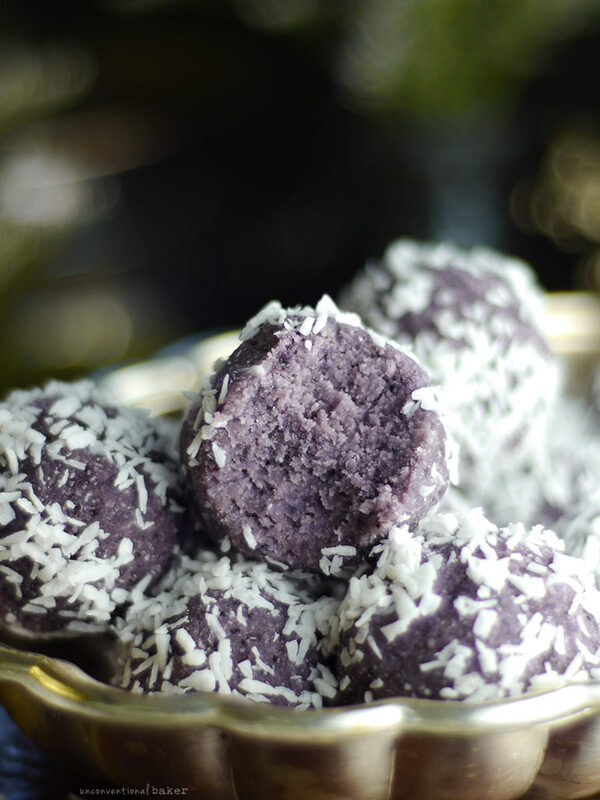 The blueberry coconut bliss balls have the most beautiful and vibrant blue-purple color. Beautiful recipe as always! I might try creating this recipe as little cookies or bars too! I love the color a lot as well. I did use variations of this idea in cookie bars, like in the lemon ginger turmeric bars — it works really well as a base for things :) Enjoy it! can’t wait to try them! ? I cant wait to make these and put them in my kid’s lunch boxes! 5 stars for simplicity, convenience and being visually appealing!! Hey Audrey! Thank you so much for being part of my 50 Epic Vegan Back to School recipes’ roundup ♥ I loved your recipe! Can you use blueberry chai seed jam instead of regular jam? Yeah, you definitely could, although the texture of the chia seeds will be noticeable in the balls. BTW, I need recepies good for my 91 year old father who finds it hard to chew very solid foods. He has a very choosy palate. What is your cup size? 250 ml? Hi Maria — yes, I use a 250ml cup. You said you prefer these refrigerated, do they have to be? I am trying to find small treats like this to make for my daughter’s trip to Japan. The flight will be almost 12 hours and I’m sure they won’t have many options for vegans. I think she would love these. Hi Tira. They are great at room temp as well and hold up for days. I’ve been making batches this past week for a friend’s daughter to take to school for snacks and they are really good for travel and would work well for a flight. I also made these with raspberry jam the other day and LOVED them, so you can try different jam flavors for variation. 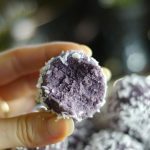 Do you think it would work if I subbed the coconut flour with a protein powder to make them more of protein bites for post work outs? I did make some batches with protein powder worked in, but I don’t think you can swap out all the coconut flour for protein powder (or another flour in general) because the coconut flour is super moisture absorbent in a way that no other flour or powder is so you’d have to change the proportions of all the ingredients in the recipe to make it work. That said, it’s just bliss balls, so playing around with quantities is easy enough. What can I substitute the coconut flour with? Have you tried it with any other flour? Hi Gem, I think for this one I’d stick to coconut flour because of its unique moisture absorbent. You’ll need to use heaps more of any other kind of flour instead, and that may alter the flavor in many different directions. That said, if you still wanted to give it a go, my immediate thought would be rice flour + tapioca flour, or sweet sticky rice flour (start with the amount specified in the recipe and increase it until you reach a scoopable/rollable consistency. Just be prepared to potentially add a lot more…). If you give it a go with any other flour, let me know how it goes — I’m all ears. Hi Anna, is it possible that you are packing the coconut flour into the measuring cup? If so, that may be the issue as you essentially end up with more coconut flour that way, and this type of flour is incredibly moisture absorbent (it’s THIRSTY!). Try using a bit less of it (or scoop it up loosely with the measuring cup). Also you can add more almond milk to moisten it until you get to your preferred consistency, but fair warning, as you’ve already experienced it’ll take quite a bit to moisten things up (just do it bit by bit until the consistency is right). I had the same issue but will try and scoop the flour loosely next time. The flavour was great but you pretty much had to eat one and then have a massively drink. So excited to try these! Little snack balls are my go to to keep on hand for that pre-dinner snack attack! Ok, I was sceptical. I thought for sure these would have that “raw” texture like most raw recipes. But, your picture looked delicious, so I tried it. I have just one word to describe these, MAGIC! Thank you so much! I am so delightful surprised at the texture & flavor! Delicious! I can’t wait to try these again with other flavors- like make a whole little rainbow plate of them! Annette, thank you so much for the beautiful feedback — made my day :) I’m so glad to hear you’re enjoying these and a rainbow platter sounds lovely. I have question about this recipes. I don’t see any baking or cooking in this. Are we eating uncooked coconut flour? Hi Trang, yes, that is correct. There’s no issue with eating it uncooked. The main thing is to re-hydrate it, which in this case happens when you mix it with the liquids in the recipes. I love bite-sized treats, especially wholesome treats like these. So pretty too! These are definitely blissful and beautiful! They look so lovely, and the recipe is something original, need to make them too! These look so pretty and seem so simple to make – I can’t wait to try them. Thank you so much for sharing this. P.S. I have made your lemon and chia seed cheesecake a number of time and it is amaazing!!!! Great :) I saw someone else shared on Instagram they made this with fresh blueberries and used extra sweetener to offset the milder sweetness of fresh berries vs. jam. Also they didn’t turn out purple with the fresh berries (because the color isn’t as concentrated), but they said it was delicious. This looks exactly like the sort of easy sweet treat I could see myself making at 10pm when I just feel like I need a little more dessert to top the day off :) Very very smart to use jam instead of fruit for more flavor and less moisture. And I think blueberry was the perfect choice because 1) delicious and 2) they’re purple!! I know. I think I was most excited about the purple of all things ? ?